When you heard of any software then the first question that arrives in your mind is how to develop software and it is always the touch task to develop software because so many steps are required in modular form for the development of software. TheSoftware development process is complex process that requires so much planning and analysis of the requirement of customers such that all the requirements of customers are gathered in it and based upon that requirement a prototype model is made that will provide basic structure to the software and each structural level is then submitted to the team of developers which will implement the programming code and finally after the step by step analysis of the development and maintenance process, they develop the software project. Before carrying out any project, the first thing that is of key importance is the management of the development cycle that includes the proper planning and analysis of the resources which is required for the project and we have to extract the maximum best suited resources for the project and all these resources after selection are shown to the customer before the starting of the project and documented in a software requirement specification document that defines sufficient design of the software along with its cost, delivery time, architecture, functions, technical issues etc. Moreover, in this phase the communication with the customer will also to be made to determine exact requirements that customer wants in the software after organizing the personal interviews with the customer and then customer finalized the prototype model of the software project then it is submitted to the next level with complete documentation. 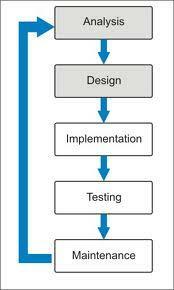 Once the planning and analysis of the customer requirement is to made then it is submitted to the programmer team that will develop the programming code for the software in which they write the scripts in integrated environment after seeing the functions required in software development life cycle and adds additional modules and functions that is mentioned by the customer in the software requirement specification document which is submitted to them by the planning and analysis team and based on that functionality, coding is to made after proper analyzing of the design part of the software project. Once the coding is to be completed then it is implemented by the designers because every software process involves program code to be implemented by the designers so that the customer requirement can be fulfilled easily and easier interface is there for the customers to understand. Moreover, In this phase we make use of complex graphics functionality along with some algorithms that will helps in the specification of software design that will improve and enhance the programming codes and scripts which is not there in the coding and designing phase. Once the software designing and coding is completed then it is submitted to the testing team which will check each and every component and functionality of the software such that whether each module is giving the correct output with the variation in the input values and if any sort of error is there in the programming code that leads to the incorrect output then instead of submitting the project back to the implementing team, the software testing team itself make relevant changes in it and removes the bug and error if any there in software and after that, senior testing officer is checking the main components of software using the verification of the modules and then it is submitted to the finalized team which will maintain the better environment for software working. Once the software testing is completed by the testing team then it is distributed among the maintenance team that implement some enhanced features in the software that would helpful for the software to cope with the future and newly discovered problems. The Maintenance team also adds new code which is often considered too much expensive for the software project because we have to make changes with the original script to add more functionality in it. Moreover, all the details of software working are written in the document that consists of the internal design of the software which will help the customer for future maintenance and enhancement. It also includes the application procedure interface for the customer support which also includes the report document which is helpful for customers as well as for company.